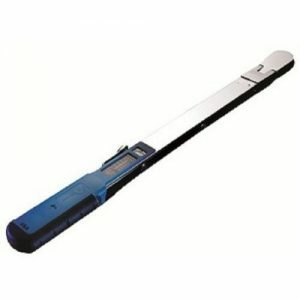 Are you looking for Best Torque Wrench ? There are some instances, where you have to screw a nut or bolt to just the right amount of pressure. Over or under doing it can cause problems, such as putting undue pressure on the surrounding surface. If you are working on a gas pipeline or an automobile part and the pressure needs to be exactly right while screwing the bolt. For this you need a torque wrench. What is a torque wrench? Torque wrench set are the tools designed to deal with such issues. Here’s a look at some of the good torque wrenches in the market. 3 How To Choose The Right Torque Wrench? The whole point of needing a professional torque wrench is precision. CDI, a name that has been trusted for quite a while in this particular field, brings to market a high accuracy product. It has everything, from the ease of use to high accuracy, even better than the average ± 4% tolerance of usual torque wrenches. Here is a detailed look at this product. The one thing that sets this tool apart is its precision. It has high precision ratings in both the counter clockwise and clockwise directions. All the readings stay within an error range of 0.9% to 0.6% depending on the torque setting. This makes your work accurate, a trait for which Snap-On is famous for. Its locking mechanism is also easy to use and highly effective. Once you reach the desired setting, you can pull down on a spring (looks like a collar) and lock it. This will hold for other operations as well, as long as you desire. You can even set it for multiple uses, as long as its lock mechanism is in place, it won’t budge. The foot lbs scale and the Newton meter scale are available separately, giving readings in two different units, quite clearly. It thus becomes easy to read. Ease of understanding the readings while working makes all the difference. The ease of use and the ease of setting up this product are commendable. It comes with a very detailed instruction guide. Making sure that even a rookie can try his hand at it if they understand the concept clearly. The feel and grip of the product are very sturdy. While working with heavy tools, it matters a lot how they feel in your hand. The rubber grip is precise. There is a clear click felt and heard when the desired torque is reached. This makes sure no extra torque is exerted. The case provided with the product is sturdy enough. However, it seems that is not perfect for all the various settings of the torque wrench as things get a bit crammed inside while storing it on the lowest setting. This is one of the best available choices that combine accuracy with inexpensiveness. All in all, a safe buy. If you are not looking to burn a hole through your pocket while buying a perfect torque wrench, this is one piece to consider. It is a rough piece that will last long while working at its prime the whole time. Most of the tools can be bought at a cheaper, viable price, especially if you don’t plan to use them much. However, tools that demand precision, and are essentially useless without it sometimes weigh heavy on the pocket. Tekton has come up with a solution that allows you to get the best of both worlds- accuracy, and affordability. 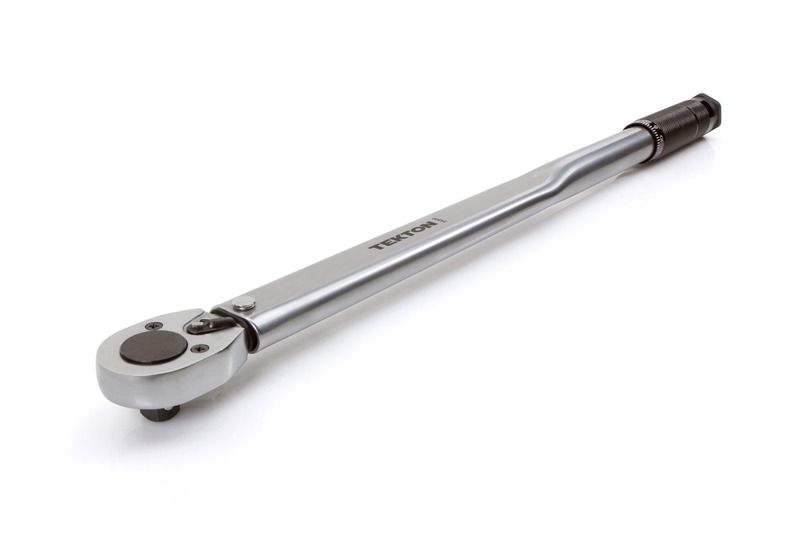 The best feature of the Tekton 24340 torque wrench is its high contrast reading. This ensures that it is easy to read, even in insufficient lightening. Even the readings are available in two ranges, n/m and in/lb, which makes it desirable for a wider range of consumers. The torque is measured in the clockwise direction only, though. So you have to be careful while working. The 24340 stands at 25 inches tall. This makes it ideal to use in automobiles such as trucks, SUV’s, cars, and other heavy machinery. Its tall structure leaves no place inaccessible, and a whole lot of force is not required for the work. The drive torque wrench is ½ inches and reversible. The head is of the ratchet style and is incorporated with Chrome Vanadium steel. This alloy stands for a tough and highly durable product, immune to rough environments. The entire torque wrench is made of 100% stainless steel and nothing else. No plastic parts are prone to breakage. It is also resistant to corrosion from natural elements such as water and air. So you can be rest assured that your torque wrench would be in working condition, even if left neglected for a long time. Even the strength factor of the torque wrench is positively affected owing to the steel construction. 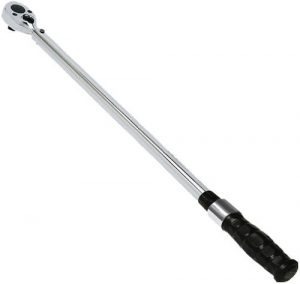 The torque wrench uses a ‘click type’ mechanism which is quite popular in similar products. Basically, you can feed any particular torque reading if you know the exact pressure needed for a job. Then when you reach that amount, there would be an audible click. That informs you that you should stop. Now, in works that require high precision, this is a blessing where even the slightest excess in pressure can damage the whole thing. A high accuracy product available at a very reasonable price. It is a good purchase for someone who is not in need of a torque wrench in everyday use, but would rather have one in their toolbox for occasional use. When the need of the hour is precision and accuracy, the name says it all. The equipment from Precision Instruments are one of industry’s best and have been hailed for their reliability. They stand true to all the tests they are put to, and here, I will examine what makes them the top of the lot. The adjustable torque wrench’s knob eliminates spring tension. As a result, there is no additional load on the mechanism of the torque wrench. Thus, it can be set up just with a fingertip touch and the entire process is super fast. Another positive side to this product is that it needs not to be calibrated, especially before keeping in storage. Most other products of the type don’t offer this hassle-free alternative. The overall length of this torque wrench is more than 22 1/8th inches. It is ideal for a wide variety of jobs and very handy to use owing to the size. Plus, it can reach all places easily. The endurance of this product is highly recommended as well. No matter if you use it every day ceaselessly or require it just in between, it will deliver the same high-end service. This is especially desired if you are a mechanic or a professional, or someone who’d need to use it way more often than occasionally. The preset factory calibrations are very accurate and need not be pondered upon. The approximate accuracy is +/- 4% over the entire range of the wrench. It is very good to work with. The touch and feel are not flimsy at all, the click is loud enough to be heard easily. Over time the product would become an integral part of your arsenal. A very affordable product that delivers quality service. Most of the products reviewed in this article are not likely to burn a hole in your pocket. This one stands out because it is good enough not just for the occasional use of the amateur, but also for the daily grind of the professional. It is sturdy and durable and feels good in your hands. Not likely to wear or tear easily. The settings are already near precise and at the same time, can be adjusted with great ease. Another fine product by CDI, a subsidiary of Snap-On whose products are well known for its durability and precision. This wholesome product is a boon for any toolkit, for its accuracy and simplicity are unrivaled. Here are all the reasons why you need to have it. What sets this apart is the effortless usability that it brings. The rubber grip with the solid feel keeps your hand at ease while keeping the required force to the minimum. Its well-balanced weight makes it comfortable for use. Snap-On/CDI products are known for their durability; they can sustain heavy work and be as accurate as possible. Plus, it comes with a sturdy box suitable protecting it from rough weather. It also includes the factory calibration certificate with the labeled date. The ‘click reading’ feature along with the calibration sheet it provides makes flaws disappear. It provides an exceptional accuracy (.9% at low, 0.6% at 100lb ranges) for your everyday work to be as perfect as you need, without you worrying about the exerted force. Quick release buttons confirm firm socket retention and easy removal. Thus, there will be a good grip on both sides of the bar. The buttons are positioned in an intelligent way as well for best feasibility. Readings are present in both Newton/meters as well as foot/lbs scales. Both are clearly visible and are easy to rotate and set the lock mechanism in place. This makes the reading stay the same. All the readings are clearly etched in chrome. You’ll know you have the small torque wrench just right. It comes with an impressive locking mechanism which doesn’t change regardless of multiple uses. Thus is perfect for daily use. An excellent placement of the lock-lever assures no hindrance in work. Excellent lock feature with steady accuracy is why this stands out. This CDI product has a pretty wholesome feel to it. It is an all-rounder excelling in every statistic as it has a bunch of features packed with a decent ability. This sturdy piece is well worth its price. It provides a lot of features along with a light frame. With its unmatched durability, accuracy and lock mechanisms, it is a must-have in for your everyday accessibility. Though the price is a little issue here, this product overcomes the shadow with its shine and strength. This one endures what others can’t – a harsh environment. Precision Instrument’s beauty comes in all steel, with pieces welded together. A Split-Beam wrench is your partner if you need work done fast and accurate. Durability and easy accessibility are the qualities which this beauty speaks of. Let’s see what it’s made of. With this in hand, you need to do no work at all. The Split-Beam design gives you enough leverage to get the work done with a touch of your finger, as you experience no weight at all. Adjustable knob with the steel body gives you maximum force with little input. The grip attached gives a good hold and feels fluent to work with. Being a Precision Instrument product, the accuracy and reliability are exceptional. All you need to do is rely on the ‘click’ which is easily heard and felt. With its feather touch mechanism and smart placing of the adjustable knob, it makes hard jobs effortless. This wrench is best suited for challenging environments. Its wielded steel built is made to handle strenuous work without hassle. It is rough enough to endure all kinds of weather or the industrial heat and fluids. With its slim and long structure, it gives you the advantage in those not-so-easily-accessible places. Spring tension, being discarded by the adjustable knob, makes it only smoother to handle, but the increase in speed it provides is much better a score. The ratcheting in this one might be a problem for some, as it works in only the clockwise direction. Thus, an error might be caused if not taken care of. You need not worry about its durability, as it comes with a year-long guarantee against manufacture disorder. It can go a long way without being calibrated, that’s where Split Beams have the upper hand. It can endure much more than your expectations. The markings on the steel are clear, but the setting dial is a little small. This might be a problem if you’re wearing gloves. This one is made to stay. It is durable enough to be the last toolbox-possession to wear off, but still be accurate enough to the last day. Split Beam wrenches are superior to micrometer wrenches, providing better accuracy and endurance while keeping the user’s force to the minimum. Sounds like a deal! How To Choose The Right Torque Wrench? Since the whole aim of buying a torque wrench is precision, it won’t make much sense if you end up buying one of an inferior quality. Because in the cases involving the use of torque wrench, safety is the prime concern. Therefore, it is highly recommended that you go for a trusted name. Also make sure there is a manufacturer warranty, which reassures you of the quality of the product. Most good names have a warranty of at least a year. The importance of accuracy, in the kind of work that would require a torque wrench, cannot be stressed enough. The more accurate the wrench is, the better would it serve you. Now, most of the wrenches would be in an accuracy range of 5%. Look for something that is at least +/- 4%, because any wrench worth its salt would have that much. Also, make yourself sure of a certificate of calibration before you make the purchase. It is also suggested that you get it serviced at regular intervals to make sure it’s in proper working order. In case you drop it, or there is any chance of the scale being disturbed, get it checked as soon as possible. Torque wrenches are available both in plastics as well as varying degrees of metal. Even though the former work just fine, the latter ones would be far more sturdy and durable. Check whether the ratcheting is bi-directional or not. That is whether it tightens the bolt in both clockwise and anti-clockwise direction. Even though it’s fine if it doesn’t, but it is always better to get something that can fasten it in both the directions. Since it’s an immensely sensitive tool, due diligence should be paid to its storage as well. Make sure the case provided by the manufacturer is hard and solid and would shield the wrench from outside harm. Always follow proper instructions before keeping it away for a long duration of time. Most of the companies have plastic storage boxes which are very durable. Make sure the wrench fits inside its cover while remaining on the prescribed settings. While working on any machinery, it is of supreme importance that you can read the scale clearly and precisely, even in low light. So no matter whether the scale is on a mechanical twist handle or a digital readout, make sure you can read it clearly even in low light. It is crucial that the etchings are sharply demarcated from the surface. Many critical mechanical components, be it in automotive vehicles or other heavy machinery, need a precise and accurate amount of pressure while tightening the bolts. A right torque wrench ensures that there is no over tightening or vice versa of the nuts. Important mechanical parts have specific torque settings which are prescribed by the company. While using torque wrenches, you can also preset the wrench at any particular reading, and it will make an audible click to let you know that the desired pressure is reached. In a toolbox, a torque wrench is an integral tool. A slight error in torque can be disastrous for your vehicles or any pipelines. The best torque wrench ensures smoothness in your everyday actions and having a handy one around is a must. Among the market there is so many types of torque wrenches from which you have to select the one most suited to your requirements. They are available in ranges and mechanisms but what matters most are the accuracy and the endurance of the product. Split Beams are the most durable ones. Torque wrenches are a one-time buy, they stay for long years, helping on every turn.